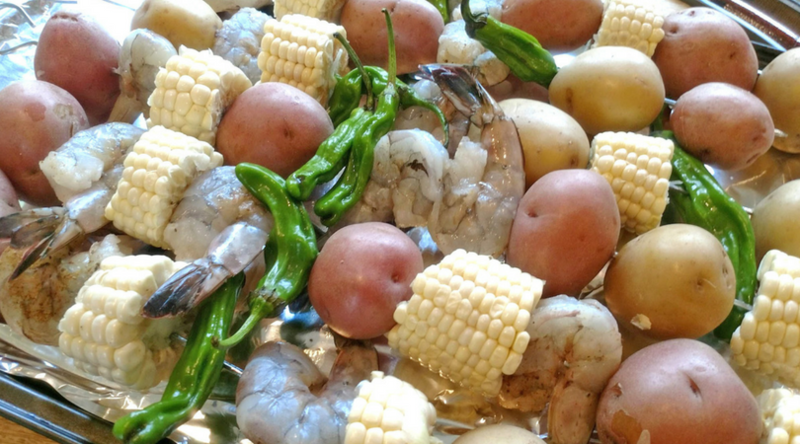 I love cajun boiled shrimp, corn and potatoes, but this is almost easier to serve at a BBQ! By boiling the potatoes in the beginning and putting all the other veggies & shrimp on the skewers, all I need to do is throw these on the grill and baste for about 15 minutes (7-8 minutes each side). 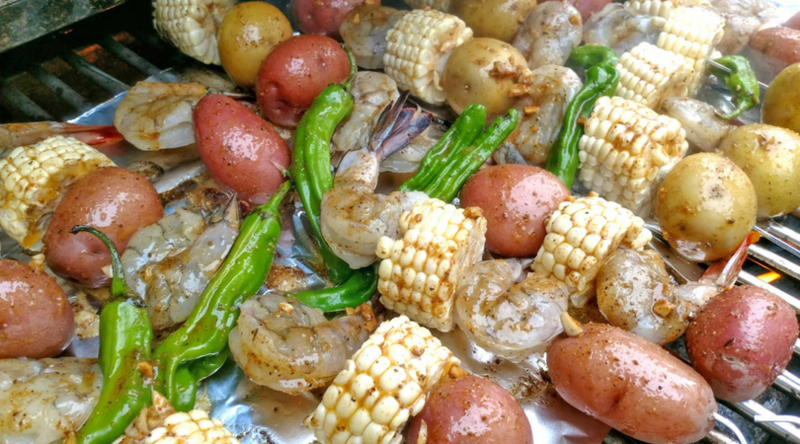 The BBQ’d veggies are fantastic and who doesn’t love freshly grilled spiced Gulf Shrimp! You can give guests their own skewer, or I like to put all the cooked food into a big serving dish so people can grab what they want. 2 pounds large Blue Gulf shrimp (U.S. only please!) – deshelled and deveined, except I like to keep the tails on. Cook the red potatoes for about 25-30 minutes in salted water until potatoes are slightly fork soft. Drain and let cool. Cut corn in vertical rounds about an inch wide. Get all of your ingredients in front of you and start to stack veggies and shrimp onto a skewer. I find that potatoes are great on the top and bottom as they sort of lock in everything on the skewer. In a mmicrowave-safeglass bowl, melt butter and add in Old Bay, Cayenne Pepper, Garlic and Lemon. Mix well and place next to grill with a food brush. Heat grill to 400 degrees and lay foil out on the grill. Carefully put skewers side by side until they fill up the grill. 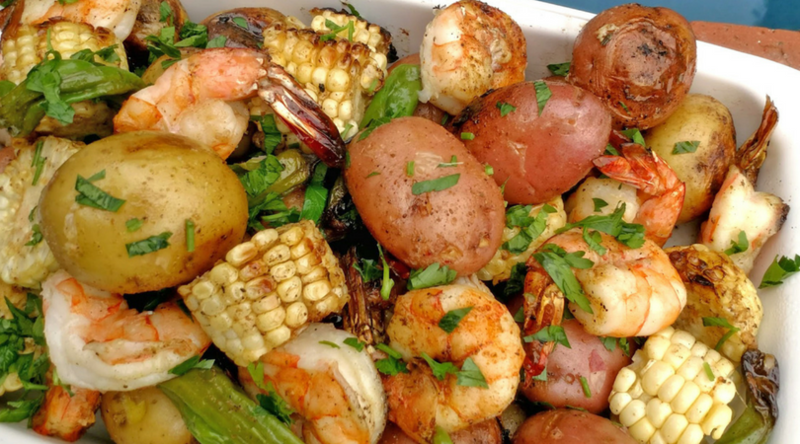 Baste veggies and shrimp with the butter mixture by painting it on each food item. After 7 minutes, flip each skewer and baste the other side. Grill for another 7-8 minutes until the shrimp are no longer clear and look cooked through. Turn off heat and using a silicone rubber mitt, quickly pull off all of the hot food chunks into a huge serving platter and serve hot!